We will discuss how to calculate the concrete breakout strength according to the ACI 318 code in this part of the concrete anchor foundation bolt design calculation example. Please refer part-1 of the calculation to understand the design problem statement and the calculations for the anchor bolt materials strength. 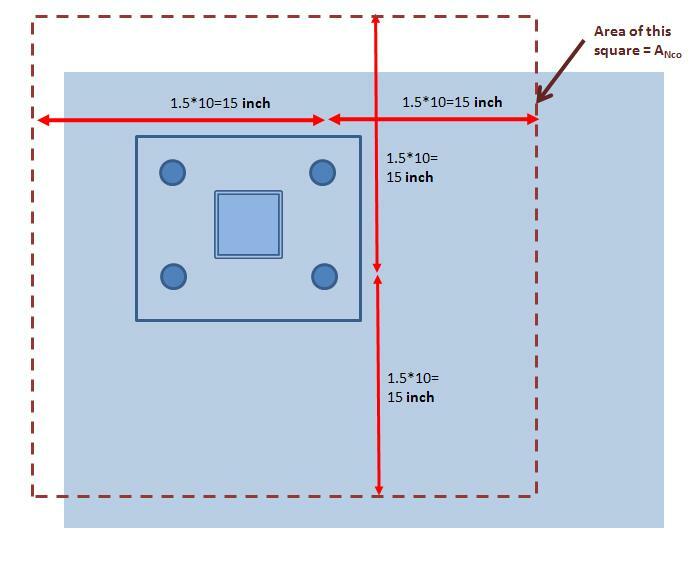 ANc –Total projected area for the group of anchors of the failure surface as approximated by a rectangle with edges bounded by 1.5hef (1.5*10 = 15 inch in our case) and the free edges of the concrete from the centerline of the anchors. Confused? You will be clearer while calculating it little later. hef – Effective embedment depth of anchor (in our case it is 10 inch). 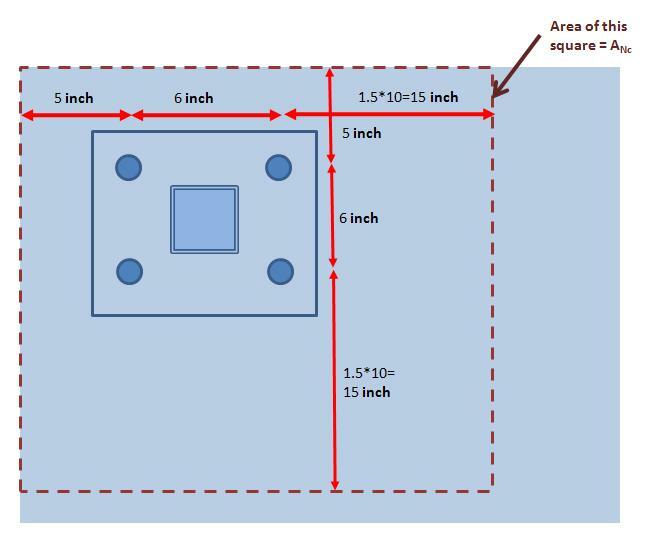 ANco – Total projected failure area approximated by a square bounded by 1.5hef (1.5*10 = 15 inch in our case) from the centerline of the anchors at all the sides. ψec,N – Modification factor for the anchor group loaded eccentrically in tension, in our case there is no eccentric loading , so ψec,N=1. ψed,N – Modification factor for edge effect for the anchor group in tension, we will calculate it later. Ψc,N – Modification factor based on the presence and absence of crack in the concrete, we will calculate it later. Nb – Basic concrete break out strength for a single anchor in tension, we will calculate it later. According to the code the value of ψc,N =1 where concrete crack is likely to occur. Kc – a factor which has value of 24 for cast in concrete. So, finally we got the concrete break out strength of the anchor group in tension as 20694.6131 lb. In the next part (Part-3) of the foundation anchor bolt design calculation example, we will discuss about calculating the concrete pull out force in tension. according to the commentary, ca,min is the minimum edge distance, not the minimum distance between bolts as you stated above.